Can The Spectre Work as a TV Drama? Fox is developing a TV series based on a DC comics character with a long history. TV shows based on comic book heroes seem to do either pretty well or just terrible. Smallville has enjoyed ten seasons on the CW, and Batman: The Animated Series was well received. The Cape - even though it wasn't based on a specific comic book - tanked despite its comic book sensibilities and the Wonder Woman show never got off the ground. Fox Studios seems committed to making comic book TV shows work, however, as it has hired a writer to develop a pilot based on The Spectre character. Brandon Camp is the lucky scribe picked to write the script, which according to the Hollywood Reporter will be an adaptation of The Spectre's original storyline of the spirit of a New York City police officer meting out justice. The Spectre has been around for a long time. 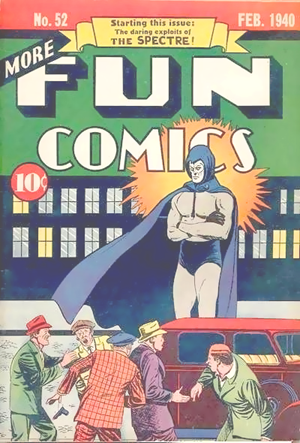 The character was first introduced in 1940 as the spirit of a murdered cop who exacted vengeance on his killers. Over the course of the Golden, Silver and Bronze Ages, the Spectre was a member of various superhero groups like the Justice League and the Justice Society of America serving as one of DC's occult characters like Doctor Fate. In the last twenty five years, the Spectre was given more backstory as the spirit of one of the fallen angels that fought with Lucifer before repenting and serving as God's embodiment of anger on Earth. All of the versions of the Spectre were therefore human hosts of this spirit. During the Crisis on Infinite Earths and Zero Hour stories, the Spectre's powers of God's anger were instrumental in defeating the Anti-Monitor and Parallax. The Spectre's history gets even more muddied when Hal Jordan gets involved. The former Green Lantern had transformed into the ultra bad guy Parallax but then his spirit entered the Spectre and began a redemptive mission in response to fan outcry. After Jordan's spirit is cleansed of Parallax, the Spectre has no human host and it goes on a rampage. How much of that will end up in the show is anybody's guess, but the possibilities for drama in the same vein as Dexter with more supernatural elements seem pretty compelling.